I might be amongst the minority with this opinion, but I vastly prefer Celaena as Aelin. Although she has not quite shed her Celaena persona for most of the book, I loved seeing the glimpses of the strong, wilful queen she will one day become. For most of Heir of Fire, Celaena struggles with her identity – she desperately tries to evade her past in spite of the numerous reminders. Although at times, I did find her POV a bit slow, I really empathised with her struggles to find herself amidst all of the darkness that has plagued her life. Watching her grow throughout the book was simultaneously difficult and rewarding. I loved the juxtaposition between the growth in her magic and her development as a character. I don’t even know how I’ll keep myself from flipping out and COMPLETELY OVERTAKE THIS POST WITH CAPSLOCK FANGIRLING but I am 100% in love with Rowan *sighs wistfully* His character type is not one I usually enjoy: broody, ancient, alpha, otherworldly creature with a tragic backstory usually has me dashing the other way – but my love for him DEFIES REASONS OK. I really love the connection he has with Aelin – I feel that they instinctively understand one another as they have both had painful history. I love the way he challenges her, always making her confront truth rather than hide behind her smart mouth and prickly exterior. Rowan/Aelin is pretty much my ship of the year, guys. I am a shameless fangirl and I am NOT SORRY. Manon is a bit like Daenerys, in that she frolicks with dragons wyverns and has a story that remains very peripheral to the main action – however, I loved reading from her POV. I feel that Manon is what I wanted book 1 Celaena to be: unabashedly bloodthirsty and iron-willed. I also really liked the matriarchy society of the witches, I thought it made for a fascinating bit of world building. Although Manon likes to believe herself a heartless monster, we all know otherwise because of her love for the underdog wyvern, Abraxos – as well as her strong connection with The Thirteen, her loyal and elite group of followers. Basically, Manon for Queen! He did not mind dying. At first, I thought to myself ‘Who is this jerk?’ when Aedion arrived and was causing all sorts of fuss for Chaol. Then I discovered that he was just a loyal puppy dog and my heart melted. I am easy like that, OK? But jokes aside, I did really enjoy his character arc – and learning about how he’s had to adapt to survive in a world ruled by his mortal enemies. Aedion is a man who can remain true to his cause, despite the lies that he has to tell the public for a decade. You just finally saw everything. And once you saw that other part of her… You cannot pick and choose what parts of her to love. Poor Chaol, if only the book/Sarah J Maas could be nice to him for once -but such is the curse of this series, all the darlings must suffer. I was never an ardent fan of Chaol, but I really felt for his struggles here. For a man who has always been straight laced and honest, he’s had to learn to be deceitful, he’s also had to deal with emotional conflicts: of anger, of confusion, of opposing loyalties. Our Captain learns in this book that doing the right thing does not always mean doing the lawful thing – and he also has to pick a side. Imagine my delight when I realise that his picking a side does not mean picking love, it means picking Dorian. They are possibly the strongest bromance in the YA fantasy game right now. When Dorian had spoken, it hadn’t been a prince who looked at him. Heir of Fire sets up the stage for the next book, and establishes an emotional core for our characters going forward. It’s also the point that the series starts coming into its main plotlines and set up its big players in the conflicts to come. I am so excited at the direction that the story is taking! Coming up next on the blog is my review of Queen of Shadows and a graphics post! If you haven’t read Queen of Shadows, check out this Goodreads Read-Along hosted by Anjie, Josie, Erika and Miedjel! Thank you 😀 I thought I’d go for Green since this is such a Terrasen book, if that makes sense. AND YESSS ROWAN. I’m extremely interested in your ToG week because I am pondering whether or not to start the series (currently leaning towards a no, but we’ll see). I hear Manon is not such a popular character, or perhaps that’s just a few particularly voracious book bloggers, but he sounds quite intriguing from what I see here. Looking forward to your QoS review — and the graphics post especially! You will have to live through the first two book which was lacklustre (OR you might find the reverse? people either love the first two or love the last two, there’s no inbetween). MANON IS AWESOME. A remorseless witch with some moral compass that she tries to deny and loves the underdogs of the world? She has my heart!! The writing really does improve with every book, though! Sarah J Maas is a wonder! I hope you’ll end up loving it! I can’t wait to hear what you think of Queen of Shadows, even though I know it will be unadulterated fanboying because there’s a lot of Rowan to go around 😉 Manon is also excellent in the next book!! I actually really like Manon as a strong female character too! YESSS I have heard so many people who tells me they refuse to call her Aelin because they don’t identify with that side of her and I am like WHY!! Yes, I think I ship Rowan with Aelin but Celaena with no one, if that makes sense. You will LOVE QoS if you preferred Aelin. I do prefer her, it’s her true self! As Celaena she was pretending to be someone she’s not. When she embraced her destiny, her name and all she is, she became HERSELF and she’s glorious! 😀 And that’s why Rowan is the best for her, and why Chaol was done from the moment he found out who she was. Also, that whole Manon and Abraxos scene where they're first matched… probably one of my favourite scenes in the whole book. I wasn't feeling the witches story arc that much until that happened. Ugh now I don't know whether I liked HoF or QoS more. HOW COULD I FORGET ahahah. I forgot the tattoo scene because it was eclipsed by the bathtub scene in QoS! I think I still prefer HoF just a smidgen because of all the emotion and angst, I really go for that stuff. BUT QoS has more ladies, and I am wont to love that as well. I AM ALSO TORN. YEAH I’m so torn! I liked the Aelin and Rowan friendship a lot and the development of it. But I also liked their relationship in QoS… Plus I liked the story arc of the witches more in QoS. I knew this is the book we would disagree on. Never fear, I still LOVE YOU DEARLY. I AM TOTALLY WITH YOU WITH THE LOVE FOR ROWAN AND THE SHIP OF AELIN/ROWAN! 💕💕💕💕 Rowan is honestly just perfect and everything about him just sends shivers through me. And I also think I prefer Aelin’s personality over Celaena! I love the personalities combined because the sass and flare of Celaena is something I adored in all the books so far. But her queenly side is definitely so awesome and I cannot wait to see more! YESSS You need to read them all, it’s like a harem, Rowan, Chaol, Dorian, Aedion, Arobynn, ALLL OF THEM ARE SORTA SWOONY. You need this in your life, Keionda! Yep, definitely my favorite of the series! And since I’m about 2/3s of the way through Queen of Shadows and I think it’s good but not great, HoF still reigns supreme. I love how the story takes a dark turn in this one. And the introduction of the witches! Just so much improvement all around from book two. 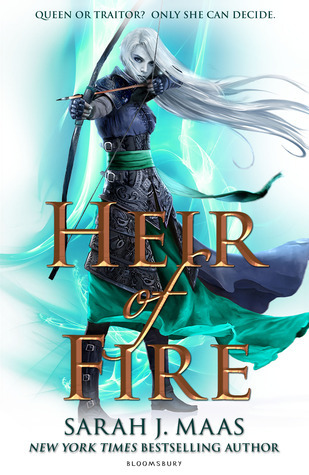 Thinking back, I think Heir of Fire is my favourite so far as well, I really liked how fleshed out the world got, I felt in Queen of Shadows the scope narrowed a little – and I preferred the character study in Heir of Fire. Queen of Shadows does have a lot of ladies though, I I do love them. I am so torn. But I agree, I love the latter two books SO MUCH MORE. I am so glad I kept reading haha. I loved Heir of Fire so much. Not that I didn’t like the first two books but this one made it bloom for me. Rowan is just my fave (as you can tell from my gushy Heir of Fire review on my blog… haha). I love how the dynamic between Aelin and him develops. Rowan is my fave as well, you obvs have great taste and we should befriend one another immediately haha! I love their relationship, they have so much chemistry URGGGHH!! Have you started on Queen of Shadows yet? Overall, this one fell flat for me. I actually DNF’d it late last year and didn’t pick it up again until this summer. I enjoyed it a lot more the second time but Crown of Midnight is still my favourite. IKR! Instead of fire and blood we have iron and blood, but close enough haha! Oh no I’m sorry to hear this book didn’t work for you, you are in good company though – I know loads of people that think Crown of Midnight is the jewel of the series! 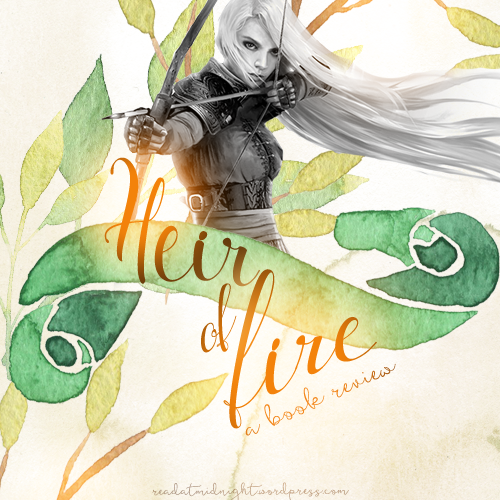 Omg your Heir of Fire graphic is GORGEOUS. Heh heh heh, I felt the same about Rowan when I first read this one. I was one of the few who shipped them and everyone was like no they are just friends blah blah. I WILL GO DOWN WITH THIS SHIP. “At first, I thought to myself ‘Who is this jerk?’” LOL. Can’t wait to see your Queen of Shadows review! Thank you :D! I just posted some wallpapers based on these graphics, if you are interested 😀 I am so glad I only read the books this year, I think wondering about Rowan/Aelin for an entire year would have driven me insane haha. The graphics in this post are so pretty! I have no idea how to pronounce any of the names. If the series ever gets made into movies I can see myself finding that I have been saying them wrong the whole time. Ahahaha that is me! When I was watching booktube discussion of Queen of Shadows, everyone was pronouncing their names differently I am so confused. But there’s a TV series soon so our speculations will be put to rest. I hate when I find out I have been reading a character’s name wrong. The actual name sounds wrong to me forever after. I first experienced this with the Harry Potter movies and Hermione. Me and most of my friends were getting her name wrong. It took me three books to really get behind this series, too, and I’m not reading any QoS reviews until I read the book (sorry). Cealena annoyed me a bit in the first two books but here she really came into her role and I respected that. Ooh, I have to order QoS now. Manon is beautiful! You will love her even more in Book 4 😀 Omg Manon and Rowan. I am not sure if ANY forces in the world could handle them, not even a whole army of Valg!! I really disliked Celaena in book one, but I ADORE her as Aelin so much! Totally creeping through your old reviews to tell you I finally got around to reading this and it is KILLING ME. I loved C/C and Now all I want/can ship is C/R and whoops I’m a total Rowan Fangirl now.